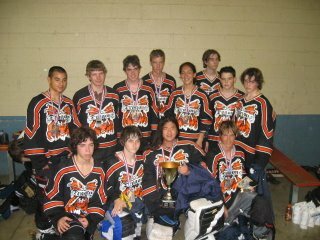 So last week's hockey tournament went well - BK's team won! The kids won windbreakers, a heavy rectangular medal and a nice trophy for the rink. At one point this year, his English teacher had the kids write out some goals for the year. One of BK's was to win a tournament. So it took nearly all year, but check that sucker off!!! They kind of expected to come in second, so it was doubly fun for them. And special, too. They have a guy on the team who has over the last 6 months, lost most of his sight. He is now legally blind, but can still see some shadows and stuff. He still suits up, and when there's an opportunity, the coach puts him in and he just sticks to one of the players, trying to keep his movement contained. But it's like having only 3 players out there, because he can't see the puck. Once in a while someone forgets and passes to him - it's just heartbreaking. He's such a nice kid and he was a real force on the team in the early part of the season - strong defense, great skater, very fast, great shooter, the whole enchilada. I don't know the name of the syndrome, but it is apparently hereditary. He has a younger sister who's already been affected. After the tournament win, the lady running the thing asked for our team captain. We don't have one, but all the kids said "M" - almost in unison. My throat closed up like I'd swallowed one of those giant jawbreakers. (Remember I am the person who will dissolve into sobs over a newspaper article.) I needed more than a couple Kleenexes for that one! So he got his picture taken with the trophy. He had to be led up to get his jacket and medal and he said the flash kind of hurt his eyes. I'm getting misty just writing this. I'm sure they wondered if we were putting one over on them about him playing, there were some mighty questioning looks, but no one asked. He's going to Anaheim for the finals tournament with us, too, but will do the same thing. If we have a decent lead, or the situation is such that he can play, he'll go out there and skate, trying to stick to one of the opponents. I'm quite sure they'll find some time in the games to use him, just so he can get whatever the team wins. OMG, I wasn't even there, I have no idea who this kid is, and I'm getting all misty. Wow. That's amazing.